Ben Wheatley producing Gothic Horror film WHITAKER! Check out this awesome advance poster! Ahoy, squirts! Quint here. I've noticed a trend in modern day filmmakers that strike it big: they like to give hands up to new people. Guillermo del Toro is probably the king of this, but Peter Jackson shepherded Neill Blomkamp, Quentin Tarantino gave a hand to Eli Roth, who in turn is producing a ton of stuff for new filmmakers... It's actually a very positive side to the industry that nobody really talks too much about, but I think it boils down to these guys being confident in their work and not feeling like they have to horde every inch of success they make away from anybody else. Everybody I mentioned is a genuine movie lover and just wants to see good movies get made. Now we can add Ben Wheatley to that list. It's not that Wheatley is so big now that he's off directing studio tentpoles, but he's found a comfortable niche making the kinds of movies he wants to make. I dig his stuff, Kill List and Sightseers in particular are standouts. 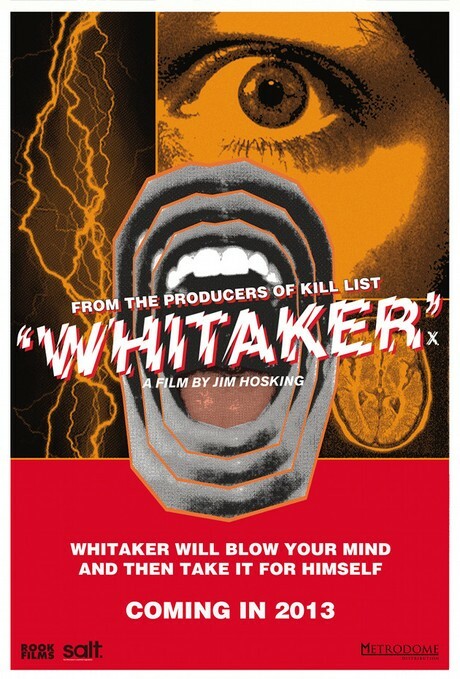 Now he's producing a gothic horror film called Whitaker to be directed by weird short film director Jim Hosking. Twitch also has a few examples of Mr. Hosking's work. I've embedded one below (totally NSFW, by the way). They're nutballs. That's not a bad thing. Very much looking forward to seeing what this hellish collaboration brings.